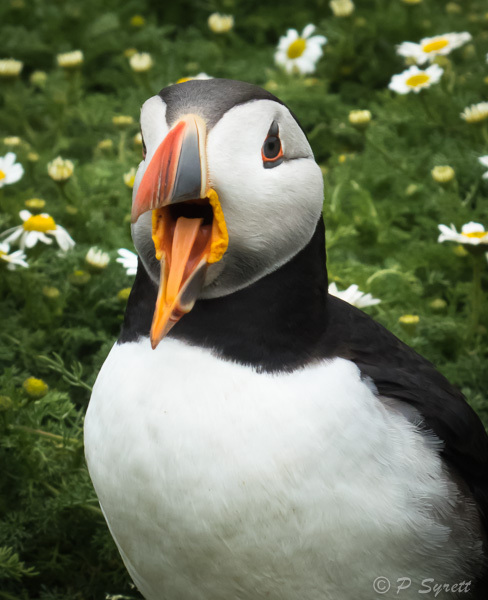 This disarming little bird is everyone’s favourite. 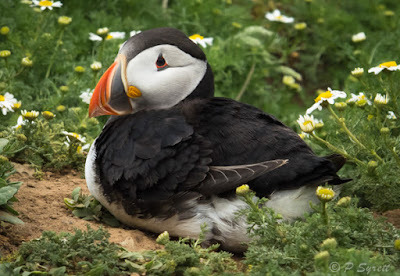 I had seen Atlantic puffins on the Farne Islands, off the coast of Northumberland, and in the north of Scotland, but the first time I had the opportunity to photograph them close-up was on a trip to Skomer Island in June. 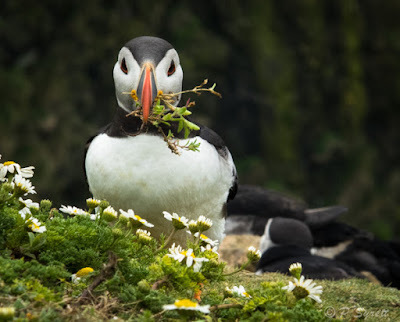 Skomer Island is a ten-minute boat ride from Martins Haven, on the west coast of South Wales. It is a National Nature Reserve owned by Natural Resources Wales, and managed by the Wildlife Trust of West Wales. 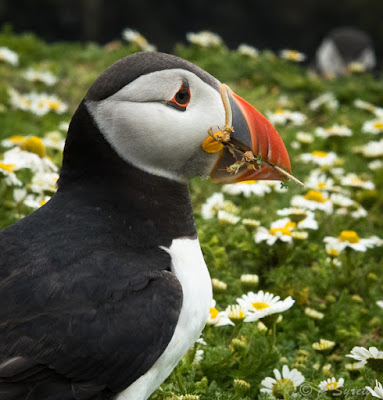 Small boats transport up to 250 visitors each day, six days a week, to spend about five hours on the island. 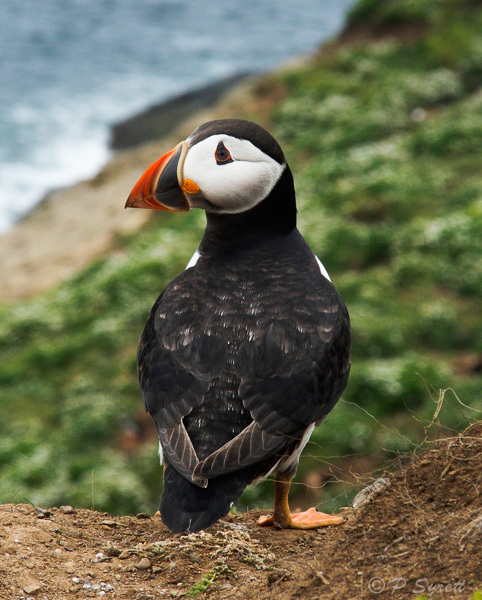 About 15 kilometres of walking track (6 or 7 km to walk around the island) keep visitors generally well spread out. Puffins are found on the island from mid March to early August during the breeding season. 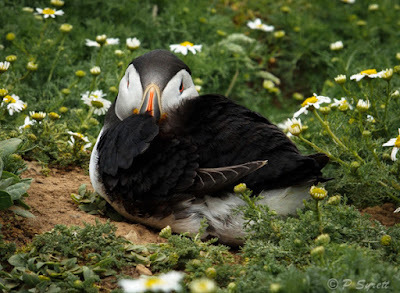 They build nests in burrows in grassy banks above the sea cliffs in April and May. 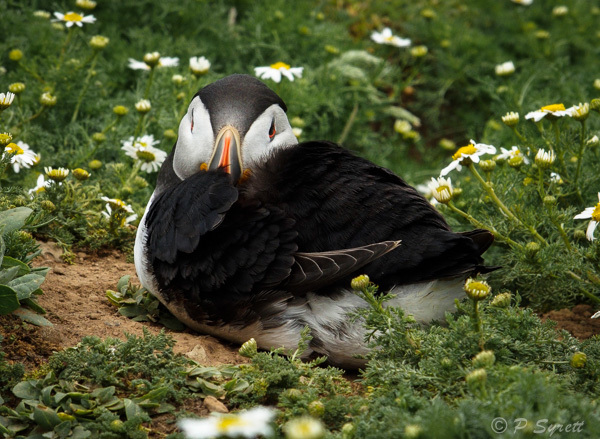 Chicks hatch from the eggs in June and fledge in July, so these two months are the most interesting for visitors. Adult birds are making the finishing touches to their nests and catching fish to feed their nestlings. 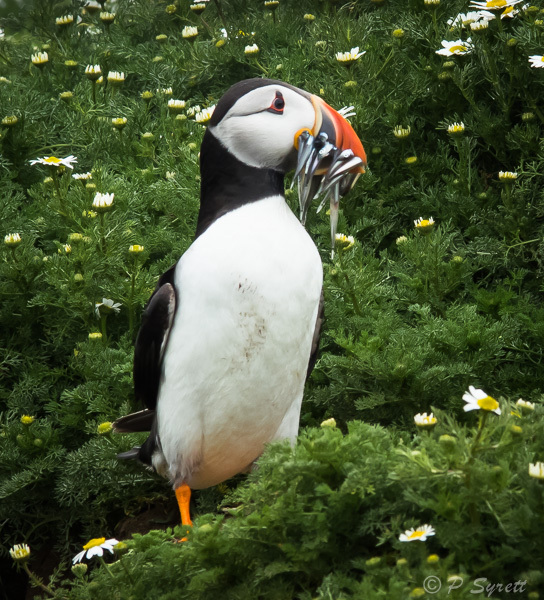 Puffins returning with a beakful of small fish (known as sand eels) are often harried by gulls, which are after an easy meal. The Skomer Island puffins are very tame, as they are used to visitors walking along a trail that passes through the centre of one of their main breeding colonies. 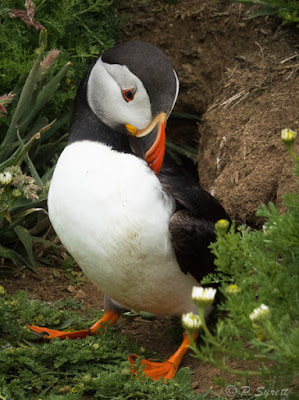 They scuttle across the path on their way from the cliff top to their burrows carrying a beakful of sand eels or nest material, dodging between the legs of visitors and photographers’ tripods. Having such a deep bill with sharp edges makes it easy for puffins to catch and hold a number of small fish at once. As each fish is caught, it is held between the tongue and upper mandible, leaving the lower mandible free to catch more fish. 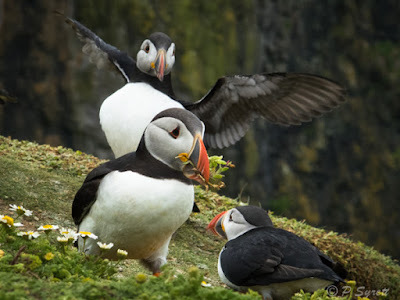 In this way a bird can hold a dozen or more at a time. 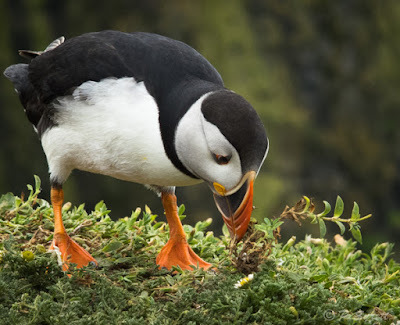 Their strong beaks are also used to excavate nesting burrows, which may be several metres long. 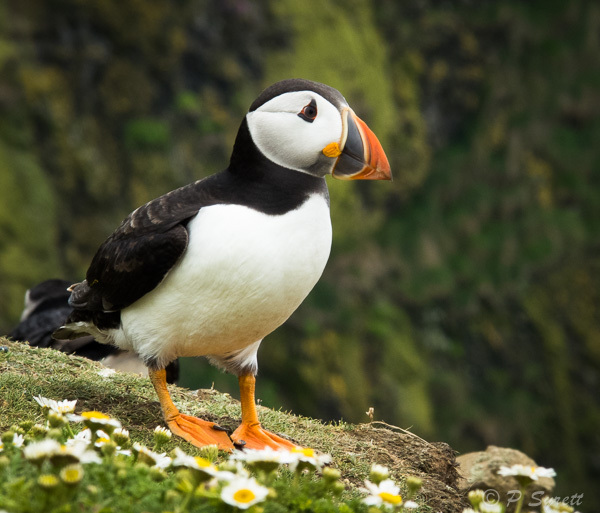 When they leave the nesting colony in early August, Atlantic puffins spend the winter in the Atlantic Ocean, not returning again until March.